Here’s another picture from our garden. This one might not be as popular as some of our earlier ones (link, link) though. 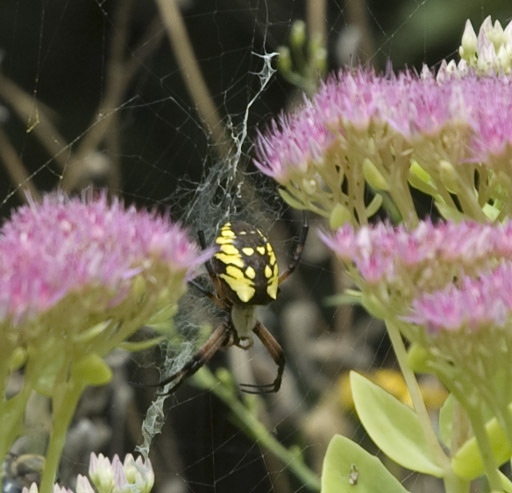 This is Argiope Aurantia, or the Black and Yellow Garden Spider. She really is beautiful. The body is an inch or so across. She seems to be eating small grasshoppers, which we have plenty of this year. They’re also known as writing spiders. It’s hard to see in this picture, but they’re called that because of the heavy white line zigzagging through the web. This is called a stabilimentum. It actually does look a little like text. Perhaps this is the type of spider E. B. White had in mind.